Tickets are $10 general admission, $8 for FSU faculty and staff, and $3 for FSU students with ID. Tickets are available on ETix or by calling (910) 672-1724. Fayetteville State University Theatre kicks off its 2018-2018 season with a fresh take on a hallmark, classic play. 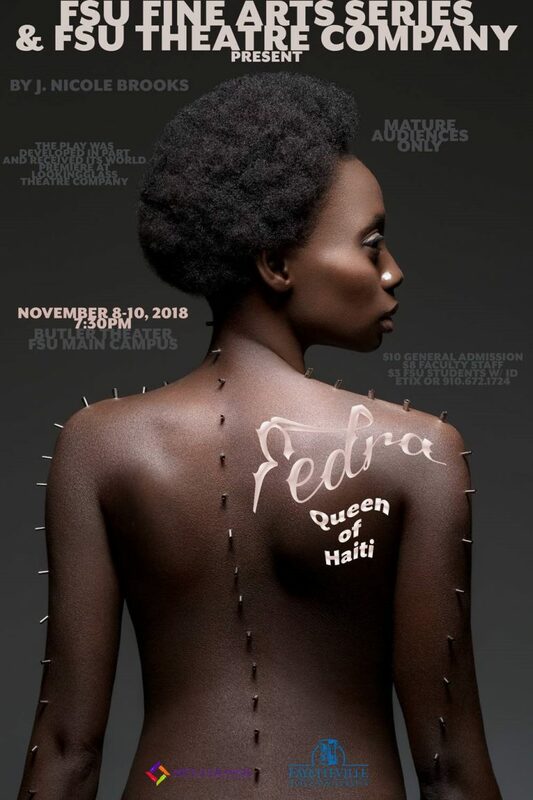 Fedra: Queen of Haiti, by J. Nicole Brooks, explores the rise and demise of Fedra, a monarch of an imagined Caribbean Empire set several decades in the future. Developed and premiered at Chicago's acclaimed Lookingglass Theatre Company, Fedra is a shocking retelling of a classic story that first appeared on the Roman stage and then later in a monumental French version by Jean Racine. Racine's Phedre is one of the prized roles in all of dramatic literature, on par with Hamlet and Medea. Brooks' version upends and revitalizes the originals as it imagines Haiti as a world superpower as the globe faces an uncertain and turbulent future affected by climate change, species disappearing, and a timeless struggle for power. Fedra faces an uncertain future as her husband, King Theseus, is feared dead in a helicopter crash, and as she wrestles with a forbidden love for her younger stepson, Hippolytus, and the prospect of a coup. As the characters face endless confrontation, the goddess of love, Afrodite, mettles in their affairs. FSU's production imagines a futuristic and vivacious Haiti in the vein of Wakanda, threatened from the outside by epic hurricanes and from the inside by dark whispers of conspiracy. The production is directed by Jeremy Fiebig, Associate Professor of Theatre, and designed by David Griffie, Professor of Theatre. The cast includes Mariah Freeman, Arlyn Spade, Ahmahd Moore, Leighton Galloway, Jazzmayne Hester, Mandissa Alexander, Hassana Bennett, Ahriana Edwards, and Savannah Bellamy. The production is stage managed by Jatoi Sellers and Tanjaniqua Johnson. The play is second full production since Butler Theater's extraordinary renovation, featuring all-new seating, acoustic paneling, and state-of-the-art LED lighting.